Video went viral of an arrest this week where a young child was seen exiting a car with her hands up and walking toward police. 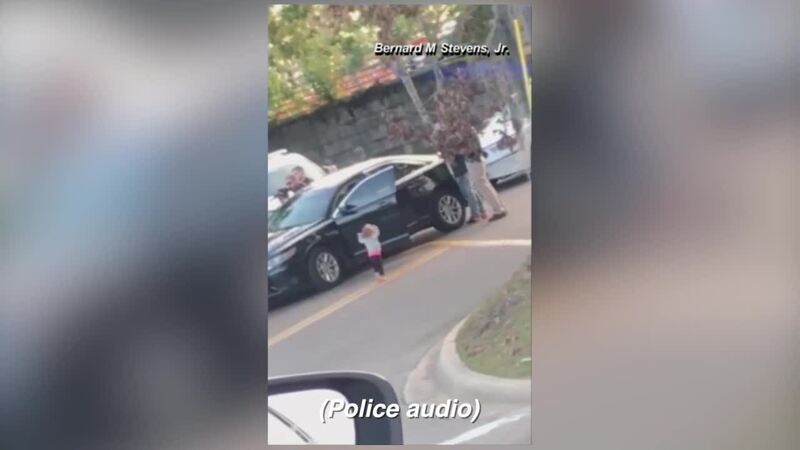 (KGTV) — Video went viral of an arrest this week where a young child was seen exiting a car with her hands up and walking toward police. A vehicle was stopped at about 4:30 p.m. Thursday in Tallahassee, Fla., Friday after police received a report of possible shoplifting from the Bealls Outlet shopping center, according to ABC-affiliate WTXL . Tallahassee Police say they received a report that one of the suspects may have had a weapon tucked under their waistband. Officers stopped a vehicle in the parking lot of the center and ordered the drivers, identified as 34-year-old Chad Bom and 38-year-old James McMullen, to exit the truck, WTXL reported. In the video that has since gone viral, as one of the suspects is handcuff a two-year-old girl is seen exiting the vehicle with her hands up walking toward police. Body cam footage showed another young child, 1, was in a car seat within the vehicle. The child's mother, who was a suspect, was allowed to retrieve the child from the seat after asking officers to hold her two-year-old daughter. The incident was reviewed by police following the video's release. Tallahassee Police Chief Michael DeLeo said in an on-camera statement that the girl, "imitated her parents by walking to the officers with her hands raised" and the footage appeared to back that up. DeLeo added the video made him "proud of how our officers handled the situation, how they adapted when they became aware of the children and the level of concern and compassion they showed to the family." DeLeo said a pellet gun was located in the vehicle. Bom and McMullen have been charged with theft, according to WTXL.